Meet the Artists and floor talks. She Sees, She Feels, She Makes is a trans-disciplinary, collective response between six Indigenous and non-Indigenous women to the feminine aspect of humanity. Together, they explore different cultural histories, and how this translates to meaningful relationships to country in Australia. Speaking through the mediums of painting, printmaking, sculpture, and photography, this exhibition includes works that harness the power of cross-cultural dialogue to investigate the nurturing and regenerative powers of the feminine. It is a direct response to current hierarchical systems of power belonging to the patriarch, a direct result of British invasion and colonisation. Through a multitude of motifs, iconography, metaphors and allegories, the exhibition explores ideas relating to myth, race, gender, empowerment, ancestry, scarification of country, spirituality, fertility, history, colonialism, ecology, identity and a sense of place and belonging through storytelling. By translating these social, cultural, political and environmental references into an elegant and sophisticated visual aesthetic, She Sees, She Feels, She Makes navigates cross-cultural terrains to re-imagine and re-interpret ourselves through the feminine aspect, as experienced through cultural diversity. The result is a collection of works that promote a greater understanding and responsibility of connecting to the land and to each other as human beings, as well as meaningful relationships to country as Aboriginal and non-Aboriginal women in Australia. The Centre Beaudesert All welcome. Free. Morning Tea provided. The artists from the She Sees, She Feels, She Makes exhibition warmly invite you to morning tea and to join them in a Talking Circle. Everyone is welcome to gather to take part in an informal, respectful and open discussion about issues relating to the exhibition such as empowerment, gender, fertility, ancestry, race, myth, spirituality, history, colonialism, scarification of country, ecology, identity and belonging to foster a greater understanding of how we each connect to the land and to each other as human beings. 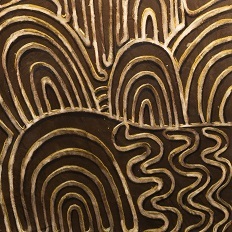 Kim Ah Sam (Kuku Yulanji and Kalkadoon) expresses her deep connection to country and her cultural identity through a unique and prolific approach to dry point etching, as well as weaving. Ah Sam’s intimate and reflective mark making on paper signifies familiar landscapes and scarification, with tracks of journeys taken and histories that evoke emotive readings. Glenys Briggs (Taungurung and Yorta Yorta) employs printmaking to focus on the women in her immediate maternal lineage - her Great Grandmother, Grandmother and Mother. They were the ones who instilled pride in her cultural heritage and the sense of who Briggs is as a First Nations woman. For example, Barban’s outer skin of kangaroo hide softly enfolds stories of her Elders with layered, textural narratives of hardship and courage forming a powerful physical core to the work. Susan Gourley explores eurocentric and anthropocentric ideologies through the prism of British invasion and colonisation and their ecological impact. She questions dominant narratives towards country using the visual metaphor of salvaged material combined with the handcrafted mimetic qualities of trompe l'oeil. Concerned about local and global environmental crises, her 'junk aesthetic of the unmonumental' offer an insight into new and respectful ways of thinking about how we connect to land and self. Paula Payne’s painting practice is an ongoing inquiry into how to best express the environmental angst of our times through representations of the landscape. Her compositions of the real and the imagined explore local and global dimensions of human innovation, intervention and cultural ruins, creating a paradox between beauty and anxiety, the visible and the invisible. Carolyn Stubbin has collaborated with Uncle Burragun John Long to create a series of photographic works. A fourth-generation descendent of European settlers, she grew up on Uncle Burragun’s country where their stories intersect and diverge. Their work examines the discourses concerning this landscape, merging with other elements that shape and influence notions of identity – history, culture and gender. Debbie Taylor-Worley (Gamilaraay) investigates what it is to be powerfully feminine in today’s male-dominated society. This has led her to create a series of works based around the female figure and primordial symbols used in religious and metaphysical practices to honour the sacred feminine. Taylor-Worley’s large energetic sculptures and canvases sing across the exhibition space, radiating cultural designs inspired by the tree carvings and northern hemisphere symbolism of her heritage.